In rural Kenya, women have few resources to call their own. Despite this, they are primarily responsible for feeding their families and taking on the lion’s share of household and agricultural work. Employment and income generating opportunities for women are meager, particularly given the time constraints of heavy household demands. More than 30 percent of all Kenyan households are headed by women, and the majority of these households face chronic food insecurity. Winrock’s USAID-funded Partnership for Safe Poultry in Kenya (PSPK) program offers a viable solution for rural, food insecure families, providing women (as well as men) with opportunities to increase income and produce an important protein source for their families. 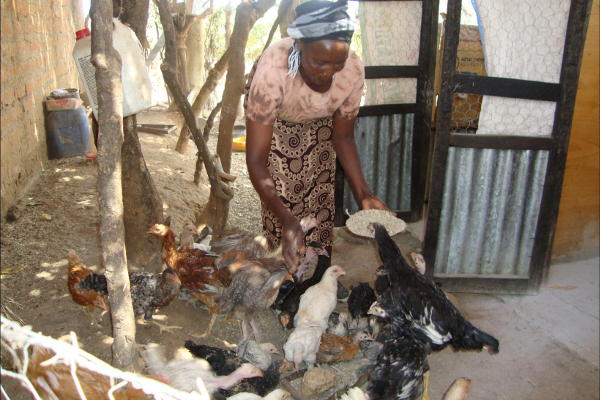 As the primary poultry producers in Kenya, women comprise more than 65 percent of PSPK’s beneficiaries. Before receiving support from PSPK, Alice Pius Makau, from Makueni District, struggled to feed her family. Household income and food sources — particularly protein sources — were extremely limited, and on some days there was not enough food to go around. Alice was already raising chickens, but was doing so ineffectively without information on how to keep her chickens healthy and free of disease. In 18 months, PSPK has trained more than 1,000 women, benefiting nearly 1,700 poor households. PSPK links poultry sector stakeholders with experienced experts from the U.S. and East Africa, who donate their time to the project as Farmer-to-Farmer volunteers. These volunteers have provided 4,800 hours of technical assistance and training to improve the lives of poultry producers in Kenya.